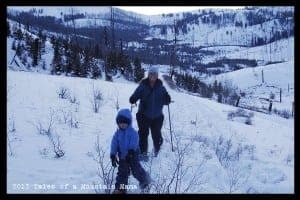 You are here: Home / Tips and Tricks / Snowshoeing – A sport for the whole family! Snowshoeing – A sport for the whole family! – A wide range of ability levels can have a great time together. 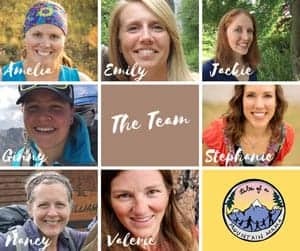 Beginners can stick to the trails until they are comfortable and more advanced snowshoers can easily head off trail to find a little more challenge. 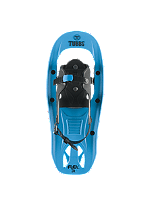 – Snowshoes need little to no maintenance (unlike skis which need wax or one kind or another). That said, the one thing snowshoeing doesn’t allow is a great thrill going fast downhill. The good news? 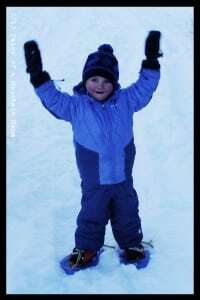 The “problem” can be easily solved by carrying your skis or a sled along with you and then hopping on for the ride down. 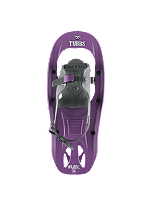 If you are careful (and good about not jabbing your neighbor with the spikes on your snowshoes) a few people could jump in a sled for the ride down without taking your snowshoes off. 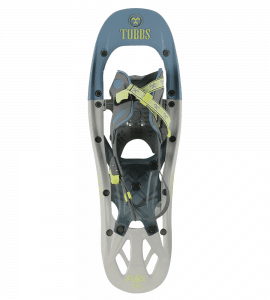 I have worn Tubbs snowshoes for years and years. I thought my previous (10+ year old) pair was great, but the Flex series blows them away. They flex (like the name implies) on the tail to allow for easier range of movement and less stress on your joints. However, my favorite feature is how SUPER easy they are to get on and off. 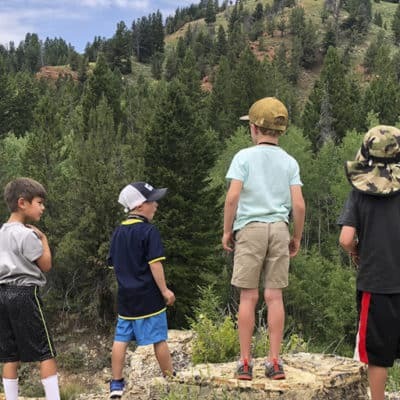 I dare say I could actually handle them (by myself) pregnant (and if you are a mom, you know how tough that can be!) They also cinch up for a great fit easily, which is HUGE. 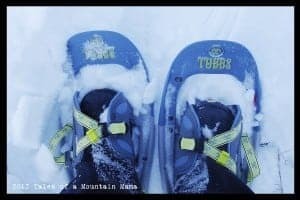 Normally, I find myself messing with the straps of my snowshoes (no matter what brand they are) throughout the trek. These I can put on and count on them to stay on and not need adjusting. 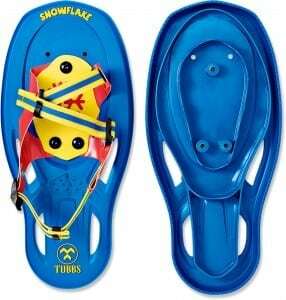 The Snowflake snowshoe ($39.95) is a great, basic snowshoe built for kids aged 3-6. The recommended shoe size is Toddler 13 – kids’ 7, but J easily wears them with a size Toddler 10 boot. While he can’t get them on and off by himself, they are fairly easy to work with gloves on. 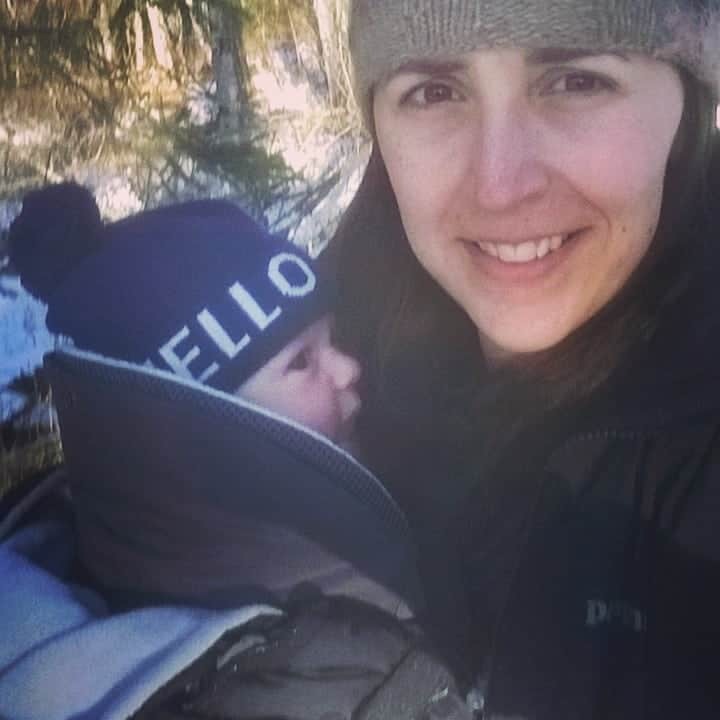 Quite honestly, I imagine he will be ready for something a little beefier by the time he is 5 or 6, but this is a great starter snowshoe. Simple, sturdy and do the job well! 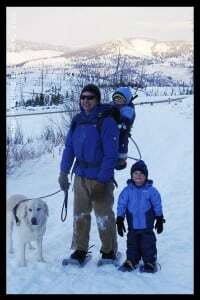 We also occasionally will let J carry his ski poles with him (that are adjustable to accommodate his growth over the years.) While the idea is great – getting him familiar with poles – he usually prefers to not use them at all. For beginners, especially, it is just one more thing to think about! 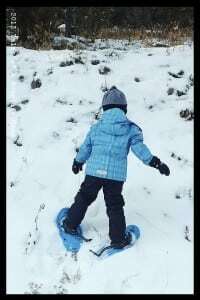 This winter we are kicking things up a little for J and were looking for some better and a little more technical snowshoes for J. P will continue to wear the Snowflakes (they are perfect for him since they are so lightweight), but J is ready for some that allow him to scale some steeper terrain. 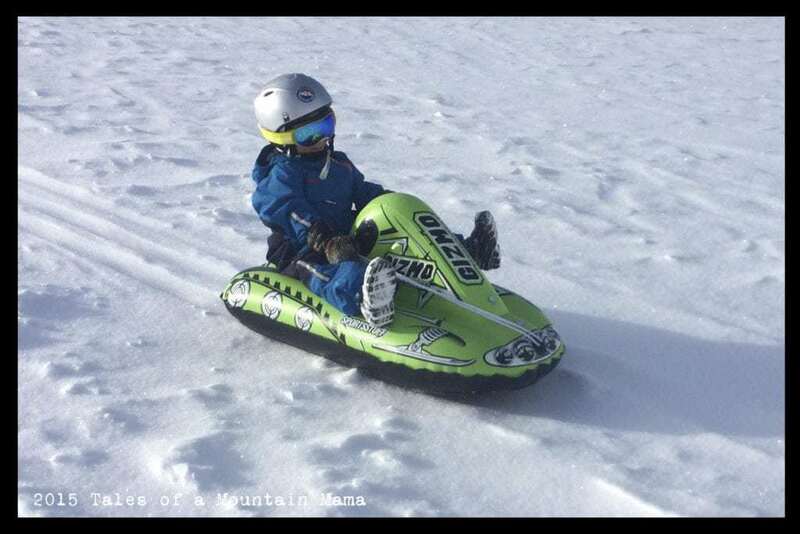 The new Flex Jr.s are great for getting kids in real snowshoes that have similar technical abilities than their adult counterparts. Built for kids aged 6-10 (though they do work for our almost-5-year-old) and 40-90 pounds, these will be what he wears for the next few years. The FLEX tail takes a little getting used to (especially for a kid used to the Snowflake shoes), but we can’t wait to see how he progresses as the season wears on. Right now he is loving being able to make them work to his advantage. TUBBS generously provided us some of this gear in order to facilitate this review. The rest we won through a contest. However, as always, the opinions expressed here are completely and honestly our own. Additionally, a few of these links are affiliates. Thank you so much for clicking through them to make your purchases – it helps offset the cost of this blog in a (VERY VERY) small way! You can find my full disclosure here. 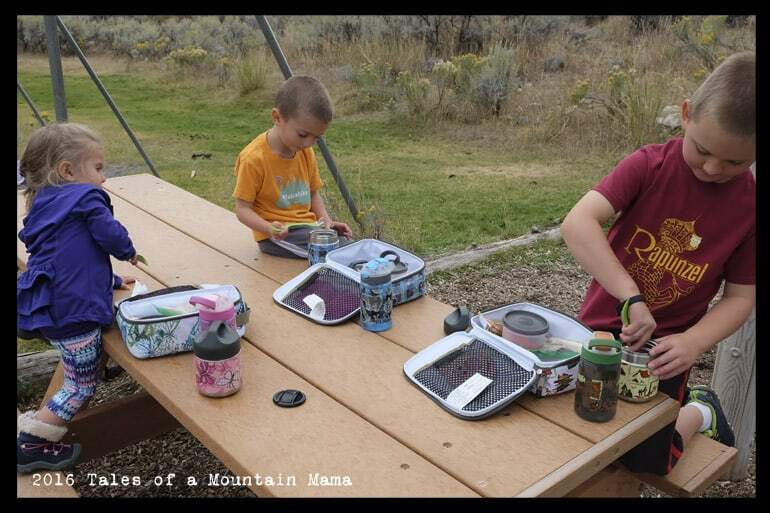 These pictures were taken from the TUBBS website.